Vin Diesel Hinting at Future Role in Marvel's 'The Inhumans' Movie? Back in 2011, before Guardians of the Galaxy was a box office hit, it was just a hope for Marvel Studios to turn into another hit comic book movie franchise. And at the time, another lesser known title was also being kicked around for a possible big screen adaptation: The Inhumans. This would basically be Marvel's answer to Fox's tight hold on to the X-Men franchise as it follows a race of early human beings who were turned into a race of superhuman warrior-servants by the Kree, the alien race from Guardians of the Galaxy from which the villain Ronan the Accuser hails. They too become an ensemble of heroes like The Avengers. Now the film might actually be on the way, and Vin Diesel may be involved in his second Marvel project. "When I first got the call from Kevin Feige [about Groot], he prefaced the call by saying 'This is the strangest character Marvel has ever attempted.' He said 'Don’t answer me now, but instead of making the fans wait until 2017, there’s something that would be a brilliant idea, we think you could be the only person who could bring the emotion to this very challenging task. Don’t answer me Vin, don’t answer me, let me send over my conceptual art.'" What exactly would they be making fans wait for in 2017? Well, putting all these pieces together, it just might be The Inhumans. And Badass Digest hypothesizes an interesting scenario where Diesel would play a character named Black Bolt. When taken into consideration along with his role as Groot, it's kind of amusing because the character doesn't talk because his voice is extremely destructive. 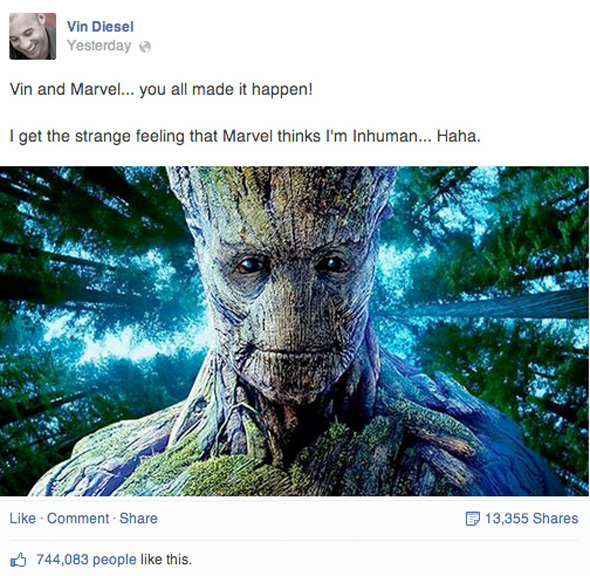 Therefore, Diesel would be the voice of Groot and the body of Black Bolt, and have two roles in the Marvel universe without overstaying his welcome. At the end of the day, Marvel has booked the dates May 5th, 2017 and November 17th, 2017, so it stands to reason that one of those films could be The Inhumans (especially after the success of the lesser known Guardians of the Galaxy) while another could belong to a staple franchise. Kevin Feige himself has said that he would like to introduce a new franchise and continue another the same year, which is why they have at least two films scheduled every year through 2019. For now, this sounds like a solid educated guess of what Marvel has in store down the road, and what Vin Diesel might have coming up in the near future. Hopefully we'll get some more solid news on The Inhumans soon. Thoughts? Black Bolt not only has the coolest name ever (Blackagar Boltagon) but he is potentially THE strongest good character in the Marvel universe. I have full faith Vin can bring the expressions to show character to a mute. I would be all for Vin Diesel playing another character in the MCU. I would be interested in Bradley Cooper doing the same. I really like Vin as an actor despite him being typecast. Ive always felt if he branched in the right direction he could change that. I hope this is that direction. Yes. But I think FANTASTIC 4 has her locked up. Holy crap, Vin as Blackbolt would be epic. That character could level the MCU with a whisper. Such restraint and power that dude has. Check out when he the Hulk confronts him. I liked Tom Hardy for this role but Vin would be a welcome addition to the live action MCU. "Lesser known title was being kicked around." "Lesser known", that is, if you're a complete comics outsider. Or one of these newbies who think that comics began with Marvel Ultimates and the New 52. There are a LOT of comics outsiders. I love comic book/superhero movies, but outside of Watchmen I've never picked up a superhero comic in my life. I go to wiki to learn about characters/stories I don't know much of. I've been aware of the gist of the Inhumans for a while now, but I would still say that I don't really "know them". It isn't unfair at all to call them lesser known characters. Safe to assume that most people are in fact "Comic outsiders" I mean it is a niche. Even with the current popularity of the movies its still niche. You mean like my mom, who stopped collecting and reading comic books over 50yrs ago? She's heard of the Inhumans by association as me and my sister's kids love comics. But that's as far as her knowledge hours. Not to mention that while I'm familiar with most of Marvel's stable of characters, that doesn't mean I know anything more of Inhumans than their basic origins or that Crystal married Quicksilver to have a mundane human child, much to Magneto's dismay. Kinda like I only knew that GOTG was a band of misfit heroes with a raccoon toting BFGs and Thanos' daughter. I want to see who they pick for Maximus. I really hope this comes together. Same here. It will be interesting to see the development process for this story line. I don't see Vin Diesel playing Black Bolt. Maybe Triton? and finally Amber Heard as Crystal now I'm done.